Cilia and flagella are complex cellular structures thought to have first evolved in a last ciliated eukaryotic ancestor due to the conserved 9 + 2 microtubule doublet structure of the axoneme and associated proteins. The Tektin family of coiled-coil domain containing proteins was previously identified in cilia of organisms as diverse as green algae and sea urchin. While studies have shown that some Tektins are necessary for ciliary function, there has been no comprehensive phylogenetic survey of tektin genes. To fill this gap, we sampled tektin sequences broadly among metazoan and unicellular lineages in order to determine how the tektin gene complements evolved in over 100 different extant species. Using Bayesian and Maximum Likelihood analyses, we have ascertained with high confidence that all metazoan tektins arose from a single ancestral tektin gene in the last common ancestor of metazoans and choanoflagellates. Gene duplications gave rise to two tektin genes in the metazoan ancestor, and a subsequent expansion to three and four tektin genes in early bilaterian ancestors. While all four tektin genes remained highly conserved in most deuterostome and spiralian species surveyed, most tektin genes in ecdysozoans are highly derived with extensive gene loss in several lineages including nematodes and some crustaceans. 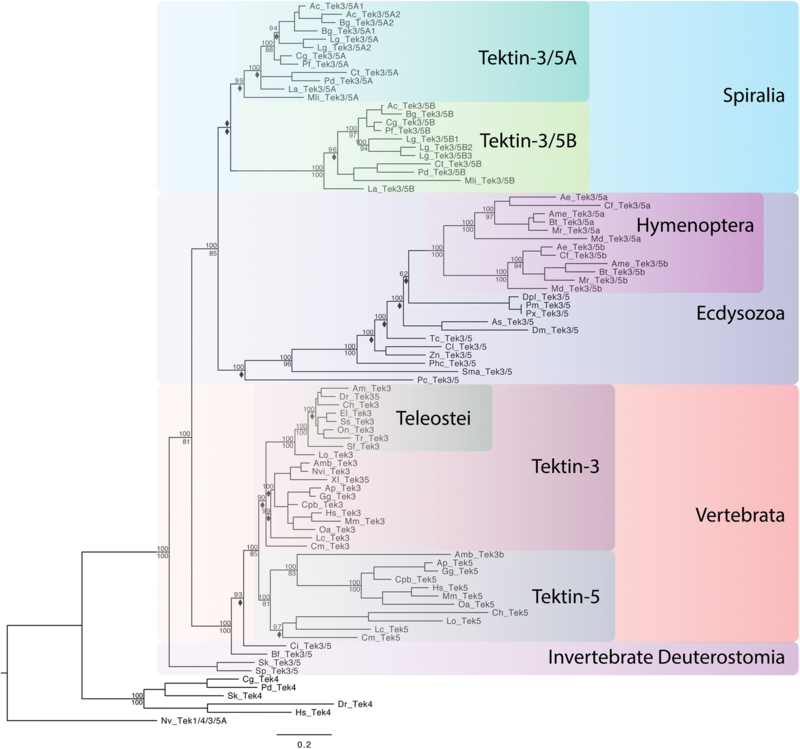 In addition, while tektin-1, − 2, and − 4 have remained as single copy genes in most lineages, tektin-3/5 has been duplicated independently several times, notably at the base of the spiralian, vertebrate and hymenopteran (Ecdysozoa) clades. We provide a solid description of tektin evolution supporting one, two, three, and four ancestral tektin genes in a holozoan, metazoan, bilaterian, and nephrozoan ancestor, respectively. The isolated presence of tektin in a cryptophyte and a chlorophyte branch invokes events of horizontal gene transfer, and that the last common ciliated eukaryotic ancestor lacked a tektin gene. Reconstructing the evolutionary history of the tektin complement in each extant metazoan species enabled us to pinpoint lineage specific expansions and losses. Our analysis will help to direct future studies on Tektin function, and how gain and loss of tektin genes might have contributed to the evolution of various types of cilia and flagella. Cilia and flagella are complex organelles found throughout the major domains of the tree of life  playing a wide variety of roles in locomotion and sensory functions. Some differences have been pointed out between cilia and flagella, such as that flagella are typically, but not always, longer than cilia, and cells may have anywhere from one primary cilium to numerous motile cilia, while cells are typically limited to one to a few flagella. Additionally, motile cilia and flagella differ in motility, with cilia beating in a stiff, oar-like power stroke, and flagella moving in a more whip-like, undulating fashion . However, beyond these differences, cilia and flagella share a number of remarkable similarities. They share a similar internal structure, being supported by the axoneme, a cytoskeletal structure made up of microtubules arranged in a circular pattern of nine doublets and two central singlets. These provide both structural support and a means of movement, allowing cilia to perform diverse functions . The presence of motile cilia and flagella as a means of providing motility in unicellular organisms such as the paramecium and the green algae Chlamydomonas reinhardtii indicate an ancient conserved role for these structures in providing cellular motility [1, 4]. This role is conserved in a variety of metazoan species as well, both in embryonic and adult stages. The placozoan Trichoplax adhaerens relies on a heavily ciliated epithelium for locomotion , as do the trochophore and lophophorate embryos and larvae of many spiralians such as the annelid Platynereis dumerilii [6, 7]. Several metazoans rely on motile cilia for locomotion in their adult form such as many species of gastropods [8, 9] and the flatworm Schmidtea mediterranea  which move about via a ciliated ventral epithelium, and ctenophores which rely on the coordinated beating of rows of long cilia, the combs, to swim . In addition, most organisms with motile sperm rely on flagella for sperm locomotion, including some multicellular plants and green algae in which sperm is the only flagellated cell type produced in their life cycle [12–15], and most metazoans. Nematodes are a notable exception, as they produce amoeboid sperm . In sponges a specialized cell type utilizes the beating of flagella to create fluid flow and actively pump water for filtration, removing food particles for phagocytosis. This cell type has been named ‘choanocytes’ due to their similarity in form and function to choanoflagellates, the group of unicellular organisms that is considered sister group to metazoans . In addition to microtubules, cilia and flagella are composed of many other proteins such as Nexins and Dyneins providing both structural support and motor functions, respectively . Another family of proteins that have been implicated in cilia and flagellar structure and function are the Tektins, a family of coiled-coil domain containing proteins first isolated from sea urchin sperm flagella . Tektin proteins have been discovered throughout many metazoan lineages as well as in unicellular organisms such as the algae C. reinhardtii . Tektin proteins are primarily composed of long alpha helices encompassing the highly conserved Tektin domain (Fig. 1a) . To date most Tektin studies have been carried out in mouse, rat and the sea urchin S. purpuratus. Tektin mutants have been found to cause defects in sperm flagella, often inhibiting fertility, as well as in cilia, affecting structure and motility. As many as five Tektins have been identified in vertebrates (Tektin-1 to Tektin-5) while in sea urchins Tektin-A, Tektin-B and Tektin-C, orthologous to Tektin-4, Tektin-2 and Tektin-1, respectively,  have been most extensively studied on a structural and biochemical level. Work in sea urchins has determined that Tektins form long filaments localized to the axoneme of cilia (Fig. 1c). Each filament is thought to be constituted of many subunits formed by three Tektin dimers: two dimers are composed by one Tektin-A and one Tektin-B molecule each forming two heterodimers, and a third dimer is formed by two Tektin-C molecules forming one homodimer [21, 22]. Thus, each filament is made up of multiples of these three dimers supported by the finding of a 1:1:1 ratio for Tektin-A, -B, and C-proteins in motile cilia [21, 23]. Recent work has determined that Tektin filaments are found within the A microtubule of each microtubule doublet and run along the length of the axoneme, and potential roles as ‘rulers’ to determine cilia length and stability have been suggested [21, 22, 24]. In mammals, mutations in tektin-2, tektin-3 and tektin-4 have led to sperm defects and subfertility [25–27]. Tektins may also play roles other than forming the Tektin filament. Additional studies on mammalian sperm have shown Tektin proteins localizing to different parts of the sperm, including Tektin-4 and Tektin-2 to the outer dense fibers [28, 29] and Tektin-5 to the mitochondrial sheath  of rodent sperm flagella. Tektin-1 has been shown to localize not only to the flagellum, but also to the acrosome of sperm in both bull and rodent . In the urochordate, C. intestinalis, Tektin-1, − 2, and − 4 are found in both sperm flagellum and branchial cilia, while Tektin-3/5, which has not previously been shown to be part of the Tektin filament, is found only in branchial cilia but not sperm flagella . With the exception of a handful of studies showing a connection between Tektin and flagella function in the algae C. reinhardtii , and expression studies in a few spiralians [33–35] and insects , very little is known about Tektin function and expression outside of mammals and echinoderms. In addition, very few phylogenetic analyses of Tektin proteins have been attempted. We have found only one previous attempt to analyze Tektin evolution , however, this study was hampered by limited data availability at the time, with only a single spiralian species and no metazoan species outside bilaterians included. 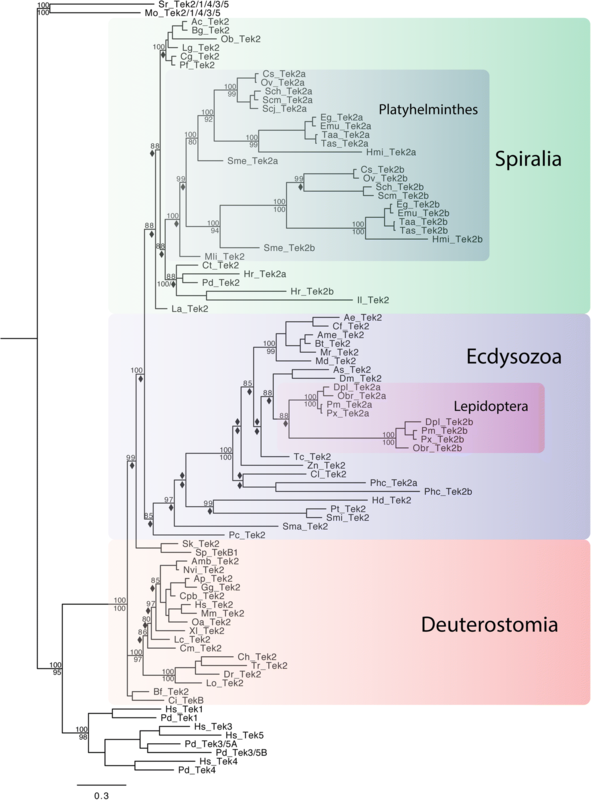 Here we have attempted the first comprehensive phylogenetic analysis of the tektin gene family utilizing Tektin protein sequences from every major metazoan clade, including recently available data from a number of spiralian, and nonbilaterian, as well as unicellular species. We provide a strongly supported framework of tektin evolution, elucidating not only the relationship of metazoan tektins with unicellular tektins, but also detailing the evolutionary history and diversification of tektins within 109 metazoan species and several unicellular species. Thus, this analysis captures the detailed description of expansion and contraction of the tektin gene complement in various metazoan lineages via evolutionary loss and gain of distinct tektin genes. This solid framework enables the formulation of new hypotheses about how changes to the tektin gene complement may have contributed to the evolution and diversity of ciliary and flagellar functions. Furthermore, it also suggests new avenues of research into the functional diversification of the tektin gene family by identifying species that have retained ancestral versus those species that exhibit a strongly modified tektin gene complement through duplications and losses. We suggest that the focus on key species with a defined tektin gene complement – ancestral or modified - will enable future studies to harness this diversity to answer fundamental questions about the role of Tektins in various cilia and flagella bearing cell types. To elucidate the evolutionary history of the tektin gene family, we used reciprocal BLAST searches (see Methods) to survey 109 species from the major metazoan lineages with a preference for phylogenetically informative taxa along with 17 unicellular species (Additional file 1). At least one tektin sequence was identified in 111 different species including all representatives from all major metazoan phyla except Placozoa as well as two choanoflagellates and four other unicellular organisms from the Chlorophyta and Cryptophyta. We were unable to find tektins in any other unicellular eukaryotic lineages most of which possess motile cilia including other opisthokont phyla or alveolate ciliates (Tetrahymena, Paramecium) or euglenozoans (Trypanosoma). Some of these species were selected to investigate whether gain or loss of distinct tektin genes was species or clade specific. Table 1 and Additional file 1 show the number of tektin genes found in distinct eukaryotic and metazoan taxa and species. It ranges from none in the placozoan Trichoplax adhaerens to up to ten genes in the annelid leech Helobdella robusta and the planarian Schmidtea mediterranea, with the majority of bilaterian species containing 4 or 5 tektin genes, and prebilaterians like sponges and cnidarians two or three tektin genes, respectively. Outliers are the bilaterian nematode species and the crustacean Daphnia pulex that contain only one tektin gene, and the prebilaterian ctenophores that contain four genes. Interestingly, only four or five tektin genes are found in vertebrates, the same number as is average in bilaterian invertebrates. This is surprising because for many gene families the vertebrate gene complement is increased by up to a factor of four in comparison to the invertebrate bilaterian gene complement as a result of two well documented ancient whole genome duplication events at the base of the vertebrate lineage [37, 38]. The Tektin proteins that we surveyed were typically 400 to 450 amino acids (aa) in length for Tektin-1, and 400 to 550 aa for Tektins-2, − 4, and − 3/5 (Figs. 1a, 2 and Additional file 2). Some sequences were found to be significantly shorter than 400 aa, but we assume these are partial sequences, while a few sequences significantly longer than 550 aa were likely due to assembly artifacts. Previous studies indicate that Tektin proteins are composed of an extended coiled-coil domain approximately 380 aa in length [20, 21, 39]. This central domain is typically flanked by less conserved N- and C-terminal regions. Located in the middle of the conserved coiled-coil domain is a characteristically less conserved linker region separating the alpha-helices in the N-terminal half from the alpha-helices in the C-terminal half of the domain . The conserved region of the Tektins generally share ~ 40–60% identity with other Tektins of the same class, and ~ 20–45% identity with Tektins of a different class (Additional file 3). The conserved coiled-coil domain is subdivided into four alpha helix domains: Helix 1A and Helix 1B at the N-terminus, and Helix 2A and Helix 2B at the C-terminus. In addition to the nonapeptide motif between Helix 2A and Helix 2B identified by Amos et al. , we identified a highly conserved LxxRxxRxxxE/DLxxD motif found both between Helix 1A and 1B and between Helix 2A and 2B. An additional conserved motif, LexDxxxKxxxxxIDxx(x)C, occurs at the C-terminal end of Helix 1B and 2B (Figs. 1a and 2). For our analysis, we used an alignment of 385 aa that covered the conserved coiled-coil domain and conserved flanking residues on either end (Additional file 4). To date the evolutionary history of tektins is largely unknown, especially outside the deuterostomes, due to a lack of comprehensive phylogenetic analyses. To fill this gap, we attempt (1) to assign bilaterian tektins to distinct classes, (2) to identify their orthologs in the nonbilaterians and unicellular organisms, and (3) to delineate the origin of each extant metazoan tektin gene. Furthermore, we aim (4) to identify species or clades that retain ancestral tektin gene complements or have undergone gene gain and/or gene loss. This information will be helpful for identifying metazoan species for future studies that could elucidate the roles that tektins have played in shaping cilia and flagella evolution and diversification. For terminology, we utilize the naming convention for the vertebrate/mammalian tektin gene complement (tektin-1, tektin-2, tektin-3, tektin-4, tektin-5). Within metazoans we collected sequences from three ctenophores, seven poriferans, six cnidarians, four xenacoelomorphs, 31 spiralians, 31 ecdysozoans and 24 deuterostomes, but were unable to find tektins in the single placozoan species (Trichoplax) (see Additional file 5 for complete list). We performed two phylogenetic analyses for each data set: maximum likelihood and Bayesian inference. For maximum likelihood we ran 1000 bootstraps of the program RAxML  using LG model of substitution rates with gamma parameter and a proportion of invariant sites. For Bayesian inference we used the program Mr. Bayes . Analysis was run for 2,000,000 generations with a burn in of 500,000 using the mixed model of substitution rates with gamma parameter and a proportion of invariant sites. For further details of alignment and phylogenetic analyses see Methods. Very long branched taxa and partial sequences were removed from final analyses. Various phylogenetic analyses enabled us to suggest a conclusive evolutionary scenario for the tektin gene complements (I) within metazoans, (II) within nonbilaterians, (III) within bilaterians, and for each of the four ancestral bilaterian tektin genes, (IV) tektin-2, (V) tektin-1, (VI) tektin-4, and (VII) tektin-3/5. Various phylogenetic analyses of the tektin gene complements, the distribution of tektin genes within each species and animal lineages, in comparison to the well-established general animal phylogeny suggest three key transitions in the emergence of the tektin complement within metazoans. Although alternative evolutionary scenarios are possible, we consider these key transitions as most likely (Fig. 3 and Additional file 6; see also Fig. 9a): (1) All extant metazoan tektins arose via duplication from a single ancestral tektin gene that was present in the last common ancestor of metazoans and choanoflagellates. The evolutionary relationship to the only other tektins found outside holozoans in a few isolated unicellular organisms, a cryptophyte and a small branch of chlorophytes, is unclear but may suggest two events of horizontal gene transfer between these very distantly related eukaryotic branches. We were unable to identify any unicellular organisms that possess more than one tektin gene. We have designated this ancestral tektin, still retained in single copy in the holozoan choanoflagellates, tektin-2/1/4/3/5 to indicate its homology to all metazoan tektins. (2) According to our analysis there was a duplication event early in the metazoan lineage prior to the divergence of ctenophores and poriferans from the remainder of the metazoans. This gave rise to two putative ancestral tektins that we have named tektin-2 and tektin-1/4/3/5 to indicate their homology to extant bilaterian tektins. 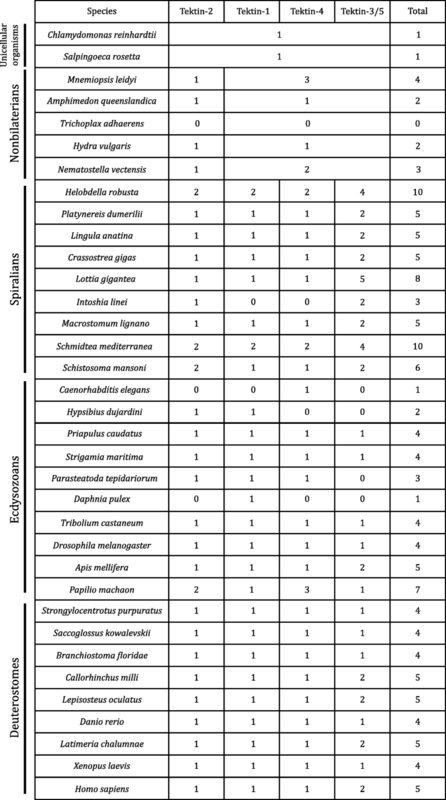 Of the 17 nonbilaterian metazoan species that were surveyed, the tektin complement ranged from zero in the placozoan T. adhaerens to four in ctenophores (Table 1 and Additional file 1). None of the nonbilaterian species that we analyzed had more than one copy of tektin-2. All species with more than two tektin genes appear to have undergone duplications of the tektin-1/4/3/5 gene. Thus, all prebilaterian metazoan tektin genes most likely arose from two ancestral genes tektin-2 and tektin 1/4/3/5. (3) All extant bilaterian Tektins can be assigned to one of four classes originating from one of four ancestral tektin genes, tektin-2, tektin-1, tektin-4, and tektin-3/5. Bilaterian Tektin-2 groups strongly with the nonbilaterian Tektin-2 s. Bilaterian Tektin-1, Tektin-4 and Tektin-3/5 all group strongly within the nonbilaterian Tektin-1/4/3/5 s. Thus, despite the fact that some nonbilaterians possess multiple copies of Tektin-1/4/3/5, our analysis indicates that all extant bilaterian tektins-1, − 4, and − 3/5 arose via duplication from a single ancestral tektin-1/4/3/5 gene. Our analysis is most consistent with a scenario in which all metazoan tektins arose via duplication of a single ancestral tektin 2/1/4/3/5 gene that was present in a unicellular holozoan ancestor. We have identified six unicellular species that exhibit this ancestral state of a single tektin gene. Surprisingly, these include four algae species, the cryptophyte G. theta and three chlorophytes – V. carteri, G. pectorale and C. reinhardtii, as well as two choanoflagellates, S. rosetta and M. ovata. Thus, the ancestral state of a single tektin has been retained without any indication for any persisting gene duplicates in these unicellular eukaryotes. Curiously, we did not find any putative tektins in other unicellular eukaryotic lineages that all possess motile cilia and/or flagella including members of the phyla Ciliophora or Dinoflagellata, or the genus Plasmodia (Table 1 and Additional file 1). Thus, the presence of a Tektin homolog in only a few algal species and the very distantly related holozoans is most likely the result of horizontal gene transfer. The alternative scenario, an ancestral tektin gene inherited from the last common eukaryotic ancestor, would have required many independent losses of tektin genes in over a dozen of eukaryotic branches. Metazoan nonbilaterian taxa comprise four main phyla, the sponges (Porifera), the comb jellies (Ctenophora), the single species phylum Placozoa, and the corals and jellyfish (Cnidaria) with a currently contended phylogenetic branching pattern (Fig. 1b). Most contentious is the question of which phyla is the sister group to the remaining Metazoa – Porifera or Ctenophora [42–46]. In contrast, Cnidaria are well established as the sister group to Bilateria. Interestingly, our phylogenetic analysis of Tektin proteins supports a clear distinction between the nonbilaterian versus the bilaterian taxa suggesting that the ancestral nonbilaterian tektin gene complement comprised of two tektin genes, and the ancestral bilaterian of four (Figs. 3, 4, and Additional file 6). Thus, there were two tektins present in the last common ancestor of the metazoans: tektin-2 and tektin-1/4/3/5, and our analysis suggests that these two tektin genes gave rise independently to the extant tektin complement in Porifera (1 to 2 genes), Ctenophora (4 genes), Placozoa (0 gene), Cnidaria (2 to 3 genes) and Bilateria (4 ancestral genes). Of the seven poriferan species surveyed, five retain this ancestral state of two tektins, while two demosponge species from the genus Haliclona retain only one, having presumably lost tektin-2. We surveyed three ctenophore species, each of which possesses four tektin genes that are orthologous to each other suggesting a set of four distinct ancestral ctenophore tektin genes. Of these four, one groups unambiguously with the poriferan and other tektin-2 s, and was named ctenophore tektin-2. While one other ctenophore tektin groups clearly with poriferan and other tektin-1/4/3/5 s, the two remaining form a cluster basal to all tektin-1/4/3/5 s (Fig. 4). As several analyses have placed the ctenophores as the sister group to all other metazoans [42, 45], this could indicate a second duplication event prior to divergence of the ctenophores from the rest of the metazoans followed by a deletion in the ancestor of poriferans and cnidarians. Alternatively, and consistent with more recent studies that support a more basal position for the sponges [44, 46], this duplication took place specifically in the early ctenophore lineage after their divergence from other metazoans, and the basal position of this ctenophore tektin branch might be due to long-branch attraction. 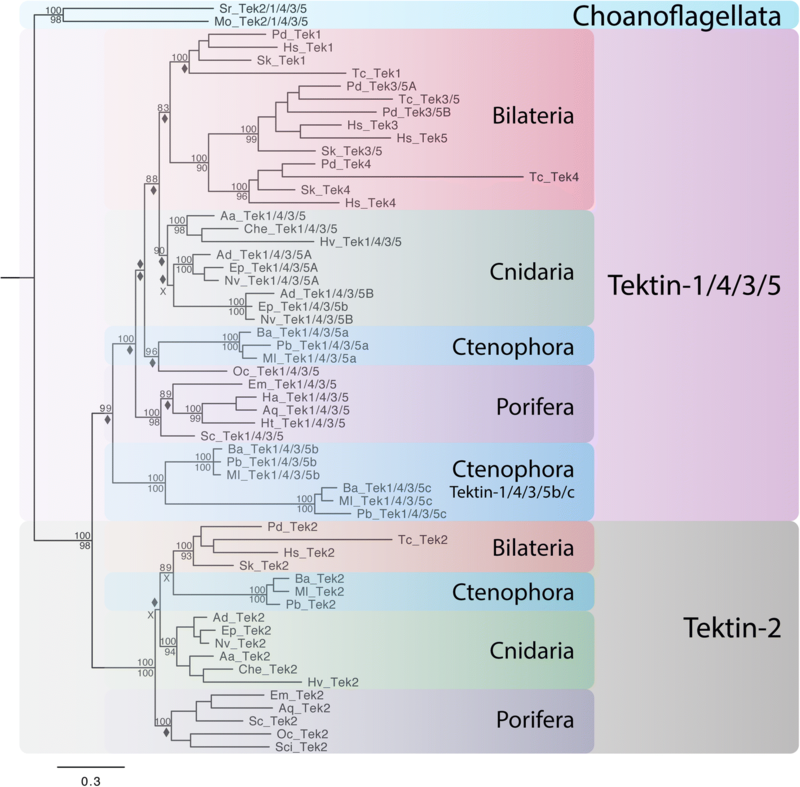 Therefore, we suggest that the extant ctenophore complement of four tektins arose from two independent duplications of the ancestral metazoan tektin-1/4/3/5 gene in the early ctenophore lineage (ctenophore Tektin-1/4/3/5a, −b, and -c), and the retention of an ancestral tektin-2 gene (ctenophore Tektin-2). Interestingly, no tektin gene was detected in the single placozoan species Trichoplax suggesting the loss of two ancestral metazoan tektin genes in this placozoan (Table 1 and Additional file 1). Although our survey was limited to six cnidarian species only, our analysis found evidence for the retention of the ancestral metazoan tektin-2 gene and at least one tektin-1/4/3/5 gene in each cnidarian species. While the two hydrozoan species H. vulgata and C. hemisphaerica retain single genes for each of the two ancestral Tektins, three anthozoan and one scyphozoan species possess three orthologous tektin genes, indicating an additional independent duplication of tektin-1/4/3/5 at some point in the cnidarian lineage. Thus, although the main target of this study was to ascertain the evolutionary relationships of bilaterian tektins our phylogenetic analyses provides a solid hypothesis for pre-bilaterian metazoan tektin evolution, that should be further tested by broader sampling. As described above our analyses strongly support an evolutionary scenario that suggest that four distinct bilaterian Tektin classes 2, 1, 4, and 3/5 arose from two ancestral tektin genes present in the last common ancestor of bilaterians and cnidarians: tektin-2 and tektin-1/4/3/5 (Figs. 3, 9a, Additional file 6). Here, we summarize some of the general observations about the emergence and evolutionary trajectory of the four bilaterian tektin genes: Intriguingly, the bilaterian tektin-2 gene remained a single copy gene in nearly all 87 bilaterian species surveyed, while losses or duplications of this gene are very rare. In contrast, the ancestral metazoan tektin-1/4/3/5 gene underwent two duplication events prior to the protostome/deuterostome split. Our phylogenetic analysis suggests that the first duplication gave rise to the ancestral bilaterian tektin-1 and a proto-tektin-4/3/5 gene. This ancestral tektin-4/3/5 then underwent a second duplication to give rise to the two ancestral tektin-4 and tektin-3/5 genes. This duplication may have occurred after the divergence of the basal bilaterian phyla Xenacoelomorpha from the protostomes/deuterostome lineage. Intriguingly all four Xenacoelomorpha species surveyed appear to lack tektin-3/5, but retain a clear tektin-4 homolog. Although this Xenacoelomorpha tektin gene clusters unambiguously with other tektin-4 s in both maximum likelihood and Bayesian analyses, it actually might represent an early bilaterian tektin-4/3/5 gene which groups with tektin-4 due to the higher sequence divergence of protostome and deuterostome tektin-3/5 s. Thus, these four tektin classes 2, 1, 4 and 3/5 were present before the protostomes and deuterostomes, and tektin-3/5 might be an ancestral nephrozoan tektin gene rather than an ancestral bilaterian one. Intriguingly, similar to the tektin-2 gene, both the tektin-1 and tektin-4 genes remained single copy genes in most bilaterian species exhibiting only rarely a duplication event (see Discussion below; Table 1 and Additional file 1). This is especially surprising within the vertebrate lineage that experienced two rounds of whole genome duplication after branching from the chordate ancestor [37, 38]. Thus, any gene duplicates of these three tektin genes that arose from these ancient genome duplications must have been rapidly lost. In contrast to the evolutionary ‘stasis’ of these three ancestral tektin genes within bilateria, we found evidence for several independent duplications of the latest emerged ancestral tektin-3/5 gene in each of the three major bilaterian lineages (see VII). One such gene duplication occurred early in the vertebrate lineage, likely due to the whole genome duplications, giving rise to the vertebrate specific tektin-3 and tektin-5 genes. Thus, while the last common ancestor of deuterostomes had four distinct tektin genes, as retained in all surveyed invertebrate deuterostomes, the last common ancestor of vertebrates already had five tektin genes. Another independent duplication of the tektin-3/5 gene occurred early in the spiralian lineage prior to its diversification, giving rise to two ancestral spiralian tektin-3/5 genes that we have named tektin-3/5A and tektin-3/5B to distinguish them from vertebrate tektin-3 and tektin-5. Therefore, we hypothesize that the last common ancestor of the spiralians included in our study already had five tektin genes also. While the vast majority of the 31 ecdysozoan species we surveyed retain only a single tektin-3/5 gene or none, we found evidence for a third independent tektin-3/5 gene duplication specific to the hymenopteran branch (wasps, bees, ants) within the arthropod insects, giving rise to the hymenopteran specific tektin-3/5a and tektin-3/5b. Thus, while the last common ancestor of ecdysozoans had four tektins, the last common ancestor of the surveyed hymenopterans had five. An additional curious general observation of bilaterian tektin evolution is a highly increased divergence of Tektin protein sequences for the three ecdysozoans tektin-2, − 1 and − 4, but not − 3/5 genes compared to orthologous spiralian and deuterostome tektins. This concerted divergence of the three ecdysozoan tektin genes is apparent by the longer branch lengths for nearly all ecdysozoan species (Fig. 3) and a much lower identity shared with orthologs (Additional file 3) suggesting a simultaneous event to relax the constraints on each of these three tektin sequences at the base of the ecdysozoan branch while maintaining strong constraints for spiralian and deuterostome tektins. As discussed above tektin-2 represents an ancestral metazoan tektin gene that appears to have persisted as a single copy gene in most metazoan species including most bilaterians. While a few lineages such as nematodes and the crustacean Daphnia pulex appear to have lost tektin-2, all other deuterostomes, many spiralians and nearly all arthropods that we surveyed maintained a single tektin-2, which is orthologous to the tektin-2 that we found in nonbilaterian lineages such as ctenophores, poriferans and cnidarians (Fig. 5, Table 1). Only two insect orders, most spiralian Platyhelminthes, and the leech Helobdella robusta, among all bilaterians surveyed, exhibit a duplication of tektin-2 (Fig. 5, Table 1, Additional files 1, 6, 7). The representatives of the two insect orders are the anopluran P. humanus corporis, and four species of lepidopterans indicating a tektin-2 gene duplication basally within the latter insect order. Because anoplurans and lepidopterans are not closely related and other insect orders have only a single tektin-2, these are most likely independent duplications. Interestingly, ten of eleven platyhelminthes species surveyed maintained two orthologous yet highly divergent tektin-2 genes, named tektin-2a and -2b while the more basally branching Platyhelminthes Macrostomum lignano and Prostheceraeus vittatus each have only one highly conserved tektin-2 gene (Additional file 7). 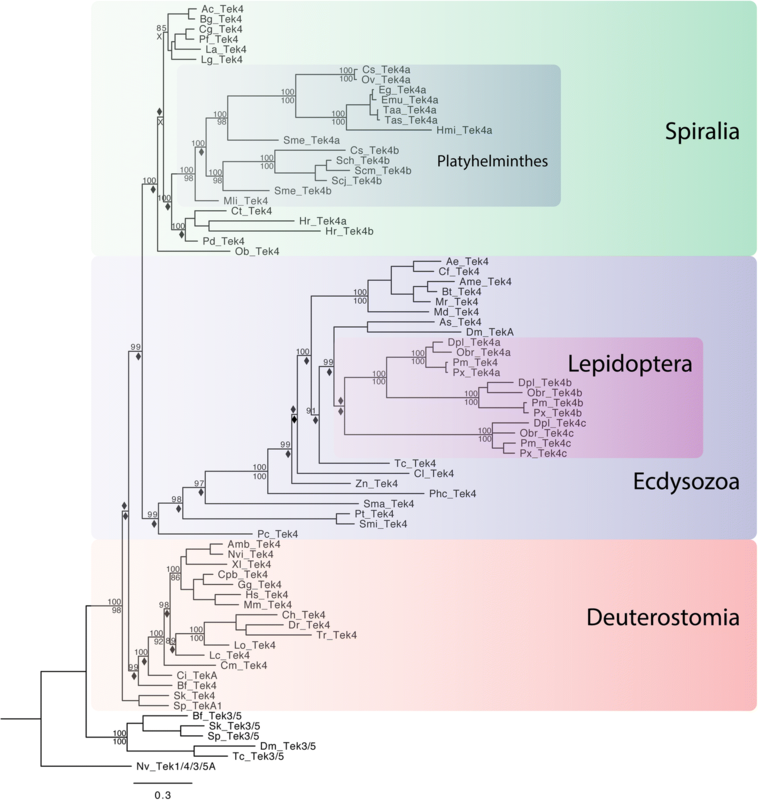 This suggests a tektin-2 gene duplication followed by subsequent sequence divergence sometime after the split of the Macrostomorpha, but before the divergence of the Adiaphanida, which includes S. mediterranea, and the parasitic Neodermata, which includes the cestodes and trematodes . With the exception of two highly derived spiralian species, the orthonectid I. linei and the leech H. robusta, the remaining surveyed spiralians including the mollusks, annelids, and brachiopod share high sequence identity (~ 50%) and exhibit short branches compared to deuterostome tektin-2 s (Additional file 7). In contrast, ecdysozoan tektin-2 s including insects as well as the priapulid P. caudatus have universally long branches and low sequence identity (mid-30%) (Additional file 3) when compared to spiralians and deuterostomes, Thus, our analysis indicates that many bilaterian lineages exhibit a general high constraint preventing tektin-2 gene duplication and counteracting sequence divergence (deuterostomes, and many spiralians), while others including most platyhelminthes and ecdysozoans exhibit a relaxation of these evolutionary constraints. According to our analysis, the ancestral bilaterian tektin-1, tektin-4 and tektin-3/5 genes all arose from a single ancestral metazoan tektin-1/4/3/5 gene. We hypothesize that an early duplication event of the tektin-1/4/3/5 gene in the bilaterian lineage gave rise to tektin-1 and a proto-tektin-4/3/5. With the exception of nematodes and the spiralian orthonectid I. linei all bilaterian species we surveyed have at least one tektin-1 gene, including the crustacean D. pulex that retains only tektin-1 and no other tektins (Fig. 6, Table 1, Additional files 1, 6, 7 and 8). Only two bilaterian species, the spiralian leech H. robusta and the flatworm S. mediterranea have duplicated the tektin-1 gene independently and exhibit high sequence divergence (Additional file 7). As observed for tektin-2, tektin-1 s in deuterostome and most spiralians – with the exception of ten of eleven platyhelminthes species - generally share high aa sequence identity (~mid-50%) and generally short branch lengths. In contrast, most ecdysozoan tektin-1 s are far more derived compared to their conserved spiralian and deuterostome counterparts, sharing less than ~ 40% (Additional file 3) identity with spiralian and deuterostome tektin-1 s. Ecdysozoan branch lengths for tektin-1 are much longer than deuterostome and most spiralian branch lengths. Notable exceptions within their respective taxa are tektin-1 of the ecdysozoan priapulid P. caudatus, and tektin − 1 of the platyhelminthes M. lignano both of which are well conserved. In contrast, tektin-1 appears highly conserved with short branch lengths and high sequence identity in deuterostome invertebrates (echinoderm, hemichordate, urochordate, and cephalochordate), and most spiralian species (brachiopod, mollusks, annelids but not leech). In summary, the ancestral bilaterian tektin-1 gene exists as a single copy gene in most bilaterians. Loss, duplications and strong sequence divergence of tektin-1 are observed but rare, and found in taxa known for their increased genomic divergence including the ecdysozoan arthropods and nematodes, and the spiralian platyhelminthes and leech. Most likely the ancestral bilaterian tektin-4 gene arose via a second duplication of the ancestral metazoan tektin-1/4/3/5 gene. After an initial duplication gave rise to tektin-1 and a proto-tektin-4/3/5, a second duplication of the latter gave rise to the two ancestral bilaterian tektin-4 and tektin-3/5 genes (Figs. 3 and 9). Intriguingly, the earliest branching bilaterians, the Xenacoelamorpha, may have retained a true proto-tektin-4/3/5 gene that strongly resembles tektin-4 of other bilaterians. Among the 88 bilaterian species surveyed, only the spiralians I. linei and D. japonicum and the ecdysozoan tardigrades, crustacean D. pulex and some chelicerates lack tektin-4, having apparently lost their tektin-4 gene independently (Fig. 7, Table 1, Additional files 1, 6, 7 and 8). The only tektin gene present in surveyed nematodes and onychophorans is likely to be a tektin-4 gene as indicated by sequence considerations including reciprocal BLASTP searches (data not shown) and an ecdysozoan specific phylogenetic analysis (Additional file 8), but phylogenetic analyses including taxa from other lineages did not result in reliable clustering with other tektin-4 s, and may alternatively suggest that the nematode tektin gene represents instead a highly derived tektin-3/5. Only four instances for retained duplications of the tektin-4 gene are observed in bilaterians. The leech H. robusta has two paralogs of tektin-4, indicating an independent duplication in this annelid lineage (Additional file 7). Interestingly, members of the insect order Lepidoptera have as many as three tektin-4 paralogs that cluster together with high support, indicating two duplication events in the lepidopteran lineage at the base of this taxon (Fig. 7). Similar to the findings with tektin-2, our analysis also suggests a tektin-4 duplication in the spiralian platyhelminthes lineage after the split from the more basally branching M. lignano, but before the split between the Adiaphanida and Neodermata (Additional file 7). Interestingly, only two platyhelminthes species (S. mediterranea and C. sinensis) retained both tektin-4a and − 4b while the eight other surveyed platyhelminthes species lost one of the two duplicates. Members of the cestodes and the trematode Opisthorchis viverrini lost tektin-4b while other members of the trematodes lost tektin-4a. Similar to our findings for tektin-1 and tektin-2, tektin-4 s are generally highly conserved in deuterostomes, most spiralians, and the ecdysozoan priapulid P. caudatus as indicated by short branch lengths and high sequence identity (~ 50–65%). In contrast, arthropod tektin-4 s exhibit much longer branch lengths and lower sequence identity when compared with spiralians and deuterostomes (mid-30%) (Additional file 3). Bilaterian tektin-3/5 forms a sister group with tektin-4 with high support, indicating that the tektin-3/5 and tektin-4 gene arose from the most recent duplication before the last common protostome/deuterostome ancestor (Figs. 3 and 9). Interestingly, tektin-3/5 appears to be the most widely conserved bilaterian tektin gene in regard to sequence conservation and gene loss, with only D. pulex definitely lacking an ortholog, while the single extant nematode tektin may possibly be a tektin-3/5 ortholog (see above). In contrast to the sequence divergence observed for tektin-1, − 2 and -4 in ecdysozoans, tektin-3/5 s appear to be similarly well conserved with similar branch lengths and protein sequence identity (mid-40% to mid-50%) within all three major bilaterian branches, the ecdysozoans, spiralians and deuterostomes (Additional file 3). In regard to gene gain, the tektin-3/5 gene is the most commonly duplicated tektin gene throughout bilaterian evolution, as it is the only bilaterian tektin that was duplicated at least once in each of the three major bilaterian lineages, with at least 11 additional independent duplications in several spiralian lineages (Fig. 8, Table 1, Additional files 1, 6, 7). Our analysis indicates that the tektin-3/5 gene duplicated early in the spiralian lineage. To confirm this we performed a comprehensive analysis of spiralian tektins including members of the Gnathifera that are regarded as the most basal spiralian lineage [48, 49]. The micrognathozoan Limnognathia maerski has both a tektin-3/5A and tektin-3/5B, but two species of rotifers have only tektin-3/5A with tektin-3/5B apparently having been lost. Therefore, the last common ancestor of the spiralians already possessed two tektin-3/5 s: tektin-3/5A and tektin-3/5B (Fig. 8 and Additional file 7). Most spiralian species we surveyed retain at least one ortholog of both tektin-3/5A and − 3/5B with the exception of the aforementioned rotifers, the cephalopod O. bimaculoides that has three paralogs of tektin-3/5A but not B, and the platyhelminthes class Cestoda which have one ortholog of tektin-3/5A, but apparently lost the tektin-3/5B gene. Dicyema japonicum is the only spiralian identified that lacks any tektin-3/5 homologs. Even the highly derived orthonectid I. linei retains single orthologs of both tektin-3/5A and − 3/5B. Several lineages have also undergone additional independent duplications of tektin-3/5A or − 3/5B. The leech H. robusta, the cephalopod O. bimaculoides and the flatworm S. mediterranea each have three tektin-3/5A, while the flatworm P. vittatus and the gastropods L. gigantea, A. californica and B. galabrata have two tektin-3/5A paralogs. The gastropod, L. gigantea, and the flatworm P. vittatus are unique among spiralians in having undergone duplications of tektin-3/5B gene, retaining three and two paralogs, respectively. The micrognathozoan L. maerski, the polychaetes P. dumerilii and C. teleta, the bivalves C. gigas and P. fucata, members of the Platyhelminthes class Trematoda, the brachiopod L. anatina and the orthonectide I. linei retain the ancestral spiralian tektin-3/5A and tektin-3/5B complement. While invertebrate deuterostomes including the echinoderm S. purpuratus, the hemichordate S. kowalevskii, and the chordates B. floridae and C. intestinalis, all retain a single tektin-3/5 gene, vertebrates underwent a duplication early in their lineage, likely as a result of one of the two ancient whole genome duplication, which gave rise to the vertebrate tektin-3 and tektin-5 genes (Fig. 8, Table 1, Additional files 1 and 6). The earliest diverging vertebrate for which we were able to find data, the ghost shark C. milli, retains both a tektin-3 and tektin-5, indicating these two tektin genes were present in the last common vertebrate ancestor. While all vertebrates we surveyed retain a tektin-3 ortholog, we found that several species lacked tektin-5. Although the holostei fish L. oculatus retains both tektin-3 and tektin-5, of the eight species of teleost fish that we surveyed, seven retained tektin-3 but lacked tektin-5, while only one, Clupea harengus, retained both tektin-3 and tektin-5. In addition, the amphibians X. laevis and N. viridescens lack tektin-5 while retaining tektin-3. For a third amphibian species, the axolotl A. mexicanum, we identified a definite tektin-3 ortholog, but a second, partial sequence is of dubious identity. BLAST searches indicate it is a tektin-3 paralog, suggesting a duplication, but our phylogenetic analysis indicates it might be a tektin-5. In either case, the absence of tektin-5 in most teleost fish and at least some amphibians indicates independent losses. All other vertebrates we surveyed, including the coelacanth L. chalumnae and the mammal H. sapiens, retain orthologs of both tektin-3 and tektin-5. Intriguingly, tektin-3/5 is the most highly conserved tektin in ecdysozoans, with branch lengths comparable to spiralian and deuterostome tektin-3/5 s (Fig. 8, Table 1, Additional files 1, 6, 7 and 8) and generally higher sequence similarity compared to other Tektin proteins (Additional file 3). Our analysis indicates that the last common ecdysozoan ancestor had a single tektin-3/5. While tektin-3/5 is definitely lost in D. pulex and possibly lost in nematodes, all other ecdysozoans that we surveyed have a single tektin-3/5 ortholog with the exception of the six hymenopteran insect species which each have two tektin-3/5 paralogs, named tektin-3/5a and − 3/5b which each cluster together with high support, indicating a gene duplication event at the base of the hymenopteran lineage. Our comprehensive sampling and phylogenetic analyses of the tektin gene complement in eukaryotic genomes enabled the inference of discreet steps in the emergence of the tektin genes during evolution (Fig. 9a). (1) The presence of single copy tektin genes in only three distantly related eukaryotic branches favors some form of horizontal gene transfer. (2) All extant metazoan tektin genes arose via duplication from a single ancestral tektin gene present in the last common ancestor of metazoans and choanoflagellates. Choanoflagellates retain this single ancestral tektin gene. (3) Duplication of this ancestral tektin gene coincides with the transition from unicellular to multicellular organisms at the base of the metazoan lineage generating to two ancestral metazoan tektin genes, tektin-2 and tektin-1/4/3/5. Most extant sponges retain these two ancestral tektin genes. (4) Repeated duplications of the ancestral tektin-1/4/3/5 gene led to independent expansions of the tektin gene complements in ctenophores, some cnidarians and the bilaterians. (5) The earliest branching bilaterians may have possessed three tektin genes, while the ancestor for all other bilaterians (Nephrozoa) possessed four tektin genes. Tektin-2 which is orthologous to the tektin-2 found in nonbilaterian metazoans, and tektin-1, tektin-4 and tektin-3/5 which arose via multiple duplications of tektin-1/4/3/5 prior to the divergence of protostomes and deuterostomes. This ancestral bilaterian complement of four tektin genes corresponds to the four major classes of bilaterian tektin genes that was maintained by some and modified by other extant bilaterian species. One of the remarkable findings of this study is the well-defined expansion from the ancestral metazoan to the ancestral bilaterian and nephrozoan tektin complement from two to three and four tektin genes, respectively, that is well supported by phylogenetic inference. Equally insightful are the intriguing modifications of these ancestral tektin complements in various extant metazoan species by tektin gene loss or gain in the context of our current understanding of Tektin function. Prior to this study there have been only two notable attempts to establish the evolutionary history of the tektin gene family proteins, both of which have serious shortcomings. The more comprehensive phylogenetic analysis of the two by Amos  was hampered by a lack of available sequence data from several important metazoan lineages, while the more recent one by Nevers et al. used an automated approach to assign tektins to orthologous groups as part of an analysis to determine the evolution of hundreds of distinct cilia-related gene families. A side-by-side comparison of the results of our study and these two previous studies is given in Additional file 9. We compare common species between the studies where possible, and in a few instances compared species of the same genus, family or order. In comparison to our study Amos  missed many tektin homologs. Only the results for mouse, frog and green algae are consistent with our study. For all other comparable species tektin homologs were either missing or misassigned. Amos suggested that humans possess at least six tektins, and her phylogenetic analysis indicated as many as ten. It should be noted that no other study has identified more than five human tektins. Upon closer inspection, we have confirmed that each of the additional human tektins found by Amos have since been deleted from the record and/or classified as pseudogenes. 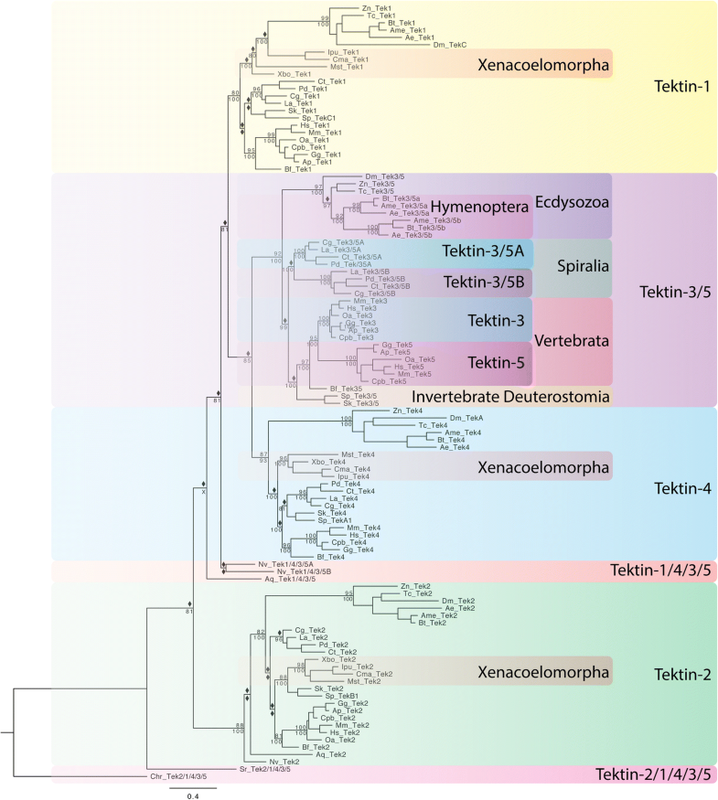 While Amos  did not explicitly recognize the tektin-3/5 class, the placing of invertebrate sequences within the tree topology as sister group to vertebrate tektin-3 and tektin-5 is nevertheless consistent with our study. Amos  also indicates that tektin-1 and tektin-4 are closer related, while tektin-3/5 is a sister group to both, whereas our study clusters tektin-4 and tektin-3/5 together with high support and tektin-1 as a sister group to both. Both studies agree that tektin-2 is the earliest diverging bilaterian tektin. Comparison with Nevers et al. is more complicated as their methodology attempted to assign all tektins as orthologs to one of the five vertebrate tektin classes utilizing an automated bioinformatics approach. Our analysis indicates that this approach fails to assign tektin orthology correctly most likely due to duplications and varied sequence divergence of tektin genes in distinct species and taxa during metazoan evolution. In addition, Nevers et al. display their results only as tektin genes present or absent in each species. Our results are consistent with the Nevers et al. for most unicellular organisms with the exception of the choanoflagellate S. rosetta. While we found only one S. rosetta tektin homolog, Nevers et al. indicates one orthologous tektin gene for each of the five vertebrate tektin classes. Despite intensive searches within S. rosetta genomic and proteomic data, we have been unable to identify more than one potential tektin homolog, and therefore suggest that Nevers et al. is in error. Among metazoans, only the vertebrate tektin complements showed any degree of consistency between these two studies, as would be expected given the methodology used by Nevers et al. . As Nevers et al. did not account for the tektin-3/5 class or the duplications early in the bilaterian lineage, all results for invertebrates are inconsistent and incompatible between these two studies. It should be noted that both Amos  and Nevers et al. were lacking broader sampling of spiralian data, with both including only flatworms from the highly derived Schistosoma genus. Thus, the comparison between these three studies indicates that (1) tektin phylogeny was in severe need of an update since Amos (, 2) that despite the growing popularity and usefulness of large scale analyses such as Nevers et al. , it is still imperative to perform careful, in depth studies of individual protein families in order to produce an accurate description of their evolutionary history. 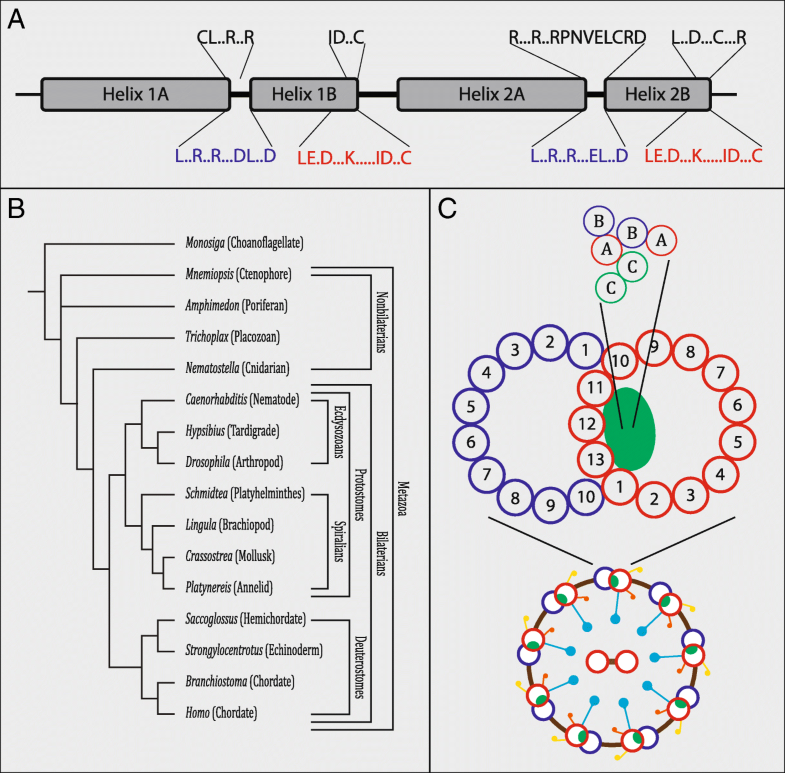 While this manuscript was prepared another large scale analysis of cilia related proteins was published  which also included Tektin proteins as part of a larger, automated phylogenetic analysis of ciliary genes. However, in regard to Tektins this analysis was largely similar to Nevers et al. , and suffered from many of the same shortcomings. Motile cilia first, tektin later? Intriguingly, tektin genes are present in only three of over 18 major unicellular eukaryotic lineages that possess motile cilia. These three Tektin-possessing lineages, chlorophytes, cryptophytes, and apoikozoans (choanoflagellates and metazoans), are phylogenetically widely separated by over a dozen eukaryotic lineages with motile cilia and/or flagella  but without any tektin gene. The most parsimonious interpretation of this distribution is that the last common unicellular ancestor with cilia did not possess tektin genes at all, and that tektin genes appeared and acquired an essential function in cilia later during eukaryotic evolution., Furthermore, this scenario suggests two or more exchanges of the tektin gene by horizontal gene transfer between these three eukaryotic lineages. Pioneering biochemical and structural studies have revealed the composition of the Tektin filaments in motile cilia in sea urchins thought to contain an equal molarity of Tektin-1, − 2, and Tektin-4 proteins corresponding to Tektin-C, -B, and –A, respectively [21–24]. Currently, no contribution of Tektin 3/5 proteins to the Tektin filaments have been reported, nevertheless more targeted studies on the localization of Tektin-3/5 are required. Thus, these filaments are apparently constructed of multiples of two heterodimers (1xTektin-2 and 1xTektin-4) and one homodimer (2xTektin-1). These filaments are thought to provide structural support within the axoneme, and might function as ‘rulers’ to regulate the length of motile cilia [21, 22]. Although our current understanding of Tektin function in other species than sea urchin is rather limited, the delineated pattern of tektin gene evolution unraveled in this study predicts distinct changes in the composition of the Tektin filament in distinct metazoan lineages (Fig. 9b). As the composition of the Tektin filament of sea urchin utilizes – besides the widely conserved metazoan Tektin-2 - two quintessential bilaterian Tektins (Tektin-1 and -4) that originated from an ancestral metazoan Tektin (1/4/3/5), the composition of the filament in ancestral metazoans and in extant pre-bilaterians must be different. One testable prediction would be that Tektin filaments in unicellular eukaryotes that possess one tektin gene like the chlorophyte C. reinhardtii and choanoflagellates are comprised of homodimers, while in extant sponges that possess two tektin genes filaments are constructed by heterodimers (Fig. 9b). Do filamentous tektin genes ‘coevolve’ within bilaterians? Given the structural composition of the Tektin filaments by Tektin-1, − 2, and − 4 units while Tektin-3/5 has to date not been shown to play a role in filament formation, it is intriguing that the three filamentous tektin genes share similar evolutionary trajectories in various bilaterian lineages. Tektin-1, − 2, and − 4 appear to be rarely duplicated or lost. Only two hexapod lineages (lepidopterans and anoplurans), the leech H. robusta, the planarian S. mediterranea, and several species of the highly derived parasitic flatworms have duplications of tektin-2, while the leech H. robusta, some flatworms, and the lepidopterans have duplications of tektin-4. Only the flatworm S. mediterranea and the leech H. robusta possess duplications of tektin-1. All other ecdysozoans and spiralians, as well as all deuterostomes that we surveyed retain at most one extant ortholog each of tektin-1, − 2 and − 4. This retention and conservation as single copy genes is especially remarkable in the vertebrate lineage where comparative genomics has firmly established two early whole genome duplication events prior to the vertebrate radiation [37, 38]. While many other gene families including the hox genes have retained many duplicated genes, all of the duplicated tektin-1, − 2, and − 4 genes in the vertebrate ancestor were apparently rapidly lost, suggesting some constraints to increasing the tektin complement. Another striking outcome of our analysis are the consistently long branches of tektin-1, − 2, and − 4 in the ecdysozoans. Whereas spiralian and deuterostome orthologous Tektins are highly conserved at the protein sequence level, e.g. spiralian Tektins sharing over 50% identity with their deuterostome orthologs and often greater than 40% identity with other Tektin paralogs, among ecdysozoans only Tektin-3/5 regularly shares greater than 40% identity with orthologs in species from the two other major bilaterian superphyla (Additional file 3). Thus, ecdysozoan tektin-1, tektin-2 and tektin-4 appear to have diverged rapidly from the ancestral sequence suggesting the loss of some evolutionary constraint at the base of the ecdysozoans or arthropods. In addition, several independent losses of all but one tektin gene in the crustacean D. pulex, onychophorans and nematodes, and loss of all tektins in some chelicerates, may also indicate the loss of some common constraint within ecdysozoans compared to spiralians and deuterostomes ‘filamentous’ tektins. Thus, ‘filamentous’ tektin genes appear to have coevolved within different bilaterian lineages, stayed highly conserved as single copy genes in deuterostomes and most spiralian species, but strongly diverged or were lost in ecdysozoans. It is tempting to speculate that the common constraint of these genes in deuterostomes and spiralians is due to the retention of a common interdependent function of these proteins within a Tektin filament in motile cilia and/or sperm flagella. On the other hand, the general sequence divergence in ecdysozoans as well as the frequent independent loss to tektin genes in nematodes, crustaceans and tardigrades may indicate loss or novel functions for the filamentous tektins. Indeed, a lack of motile cilia is regarded as a diagnostic feature of ecdysozoans , and nematodes and some crustaceans are well known for their aflagellar sperm morphology [54, 55]. Thus, it would be interesting to investigate how the divergence and reduction of the bilaterian tektin complements in ecdysozoans has affected the make-up of Tektin filaments and axonemes. Are Tektin filaments completely lost from the axonemes of all cilia? Are Tektin filaments only utilized in specialized cilia in ecdysozoans, and if yes is the filament’s composition in nematodes and the crustacean D. pulex now comprised of their single remaining Tektins only? Are ‘filamentous’ tektin genes required for motile cilia function? While the widespread presence and conservation of filamentous tektin genes in metazoans argue for some essential, conserved and ancient ciliary functions, genetic and/or other functional evidence is still scarce. Most of the tektin studies to date have focused on their role in sperm flagella in mouse, rat and sea urchin as well as cilia formation in sea urchin. There is functional evidence in mouse and sea urchin that tektins have a necessary role for motility of both sperm flagella and ‘motile cilia’, respectively [25–27, 56, 57], and that tektin mutations and dysfunction contribute to flagellar defects in mammalian sperm [25–27] and the unicellular algae C. reinhardtii as well . However, tektin genes are surprisingly absent in most eukaryotic lineages that are known to possess motile cilia including the ciliates (Tetrahymena, Paramecium) and the apicomplexan (Plasmodium), but also the placozoan Trichoplax adhaerens, the only metazoan species without any tektin genes, and demonstrate that these species do not need a highly conserved tektin gene for ciliary functions. This raises the interesting question as to how these species are able to produce functional motile cilia without the presence of tektins, while metazoans with the notable exceptions of placozoans apparently require it? One possibility to solve this conundrum could be that tektin genes are only required for distinct types of ‘motile’ cilia and flagella that are characterized by certain length, and/or by higher force generation. Alternatively, eukaryotes without tektin including ciliates, apicomplexan, and placozoans may utilize compensatory molecular mechanisms to fulfill analogous Tektin functions within their ‘motile’ cilia. Thus, these species may represent a key avenue of research into how organisms evolved new types of motile cilia without key structural proteins necessary for ciliary function in other animals. In this context, one should also discuss metazoan lineages that lost multiple tektins especially the nematodes and some crustaceans. These species are known to have aflagellar sperm morphology [54, 55], suggesting that loss of tektins might correlate with loss or reduction of flagellar sperm functions. In this regard, it is intriguing that the presence of ‘sperm cells’ is still controversial in placozoans [58, 59]. Ancestral and novel roles for tektin-3/5 in bilaterians? Our phylogenetic analyses suggest that the tektin-3/5 gene represents the latest addition to the tektin gene family within bilaterians, being absent from prebilaterian lineages, and originating from a duplication of the ancestral tektin-4/3/5 gene. Intriguingly, the evolutionary trajectory of the tektin-3/5 gene is more diverse compared to the other three bilaterian tektin genes, exhibiting more frequent gene duplications within the various bilaterian lineages. Thus, despite the sequence constrain, tektin-3/5 appears less evolutionary constrained in regard to gene duplication compared to the other tektin genes. Whether this can be attributed to novel functions demands more targeted studies. Data in sea urchins identifies only Tektin-1, − 2 and − 4 proteins as components of the Tektin filament, but this does not exclude Tektin-3/5 from any filamentous function, although localization patterns for Tektin-3/− 5 protein in the periphery of the axoneme in vertebrates  suggests diverging roles. While mutations of the tektin-3/5 paralog tektin-3 in mammals have been associated with structural defects in sperm flagella, it did not negatively impact fertility . Additional studies are certainly needed to elucidate its actual role in sperm flagella and/or motile cilia. Duplications of the bilaterian tektin-3/5 gene are most prominent in spiralian lineages. 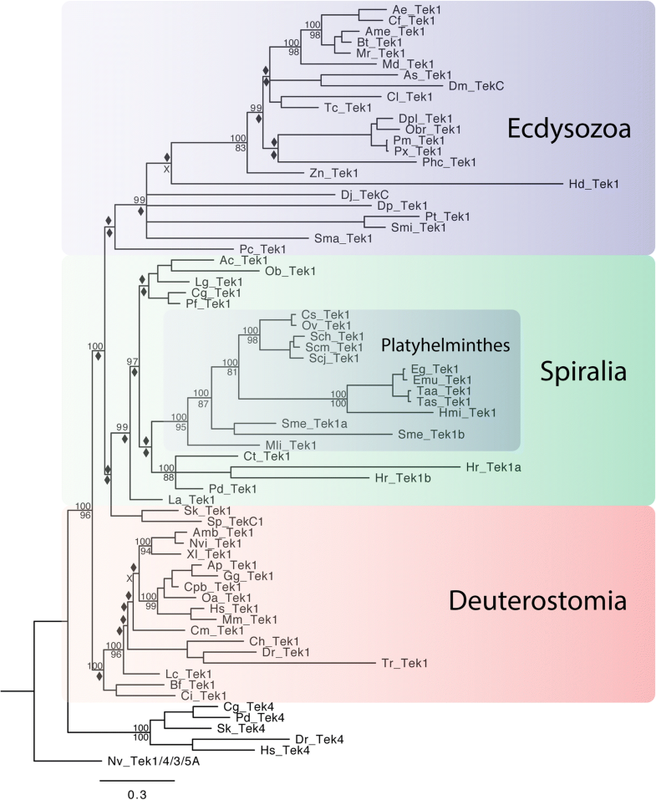 Especially intriguing is a duplication of tektin-3/5 early in the evolution of spiralians giving rise to a tektin-3/5A and − 3/5B gene that have been retained in most annelids, mollusks, platyhelminthes, and brachiopods included in our study. Thus, the existence of these two distinct tektin-3/5 genes may represent an intriguing and useful synapomorphy for the spiralian clade. Consistently, this study identified clear orthologs for both tektin-3/5A and tektin-3/5B genes in the orthonectid I. linei, a species within a taxon that a recent genomic study identified as a highly derived spiralian . Our study also found frequent additional independent duplications of the tektin-3/5 gene in several spiralian species including the leech H. robusta, the planarian S. mediterranea and cephalopod O. bimaculoides as well as in the three mollusk gastropod species L. gigantea, A. californica and B. galabrata. Thus, expansions of the tektin-3/5 gene families have occurred apparently independently in both direct developing species (without apparent larval stages), as well as in indirect developing species (with one or more larval stages), respectively. It will be interesting to see where and how these additional tektin-3/5 genes might be utilized. Gastropod species may use species-specific expansions of tektin-3/5 genes for the various ciliary structures and functions of their larvae while direct developing species like planarians and leech may utilize them in specialized ciliary based sensory structures to facilitate their similar aquatic life style. In contrast to the frequent duplications in spiralians, the tektin-3/5 gene was retained as a single copy gene in most ecdysozoan lineages, exhibiting less divergence from the ancestral bilaterian tektin-3/5 sequence than the three ecdysozoan ‘filamentous’ tektin genes (see above). As far as we know no study addressed tektin-3/5 function in any ecdysozoan species, though it promises to yield insights into potential ancestral functions. The observed duplication at the base of the insect hymenopteran clade comprises an interesting synapomorphy among bee, wasp, and ant species. Our study indicates that the tektin-3/5 gene was retained as a single copy gene in invertebrate deuterostomes including the ambulacrarian echinoderm and hemichordate species, as well as the chordates B. floridae and C. intestinalis, and remained strongly conserved in sequence. Currently unknown, studies to localize and determine the function of Tektin-3/5 protein would be especially informative in these species. Our analyses indicate also that all vertebrate tektin-3 and -5 genes are the result of a duplication of the ancestral bilaterian tektin-3/5 gene early in the vertebrate lineage. Thus, these genes may represent the sole surviving duplicated tektin genes retained from the two whole genome duplications that took place early in vertebrate evolution [37, 38]. Although current classification defines tektin-3 and tektin-5 as different tektin classes, these are clearly vertebrate specific, and we suggest designating them as members of one bilaterian tektin-3/5 class to reflect their evolutionary history correctly. In this context it is also interesting that a knockout study of tektin-3 in mice observed defects in sperm flagella but nevertheless retained normal fertility, while tektin-4 knockouts had impaired fertility also [25, 26]. As studies have not yet determined the role of the tektin-5 gene in mice, it could be that the closer related tektin-3 and tektin-5 retained some functional redundancy in vertebrates, requiring both to be lost before fertility is impaired. We infer from our analysis that the last common ancestor of the protostomes and deuterostomes possessed single copy genes for four ancestral bilaterian tektin genes corresponding to four instead of five currently defined tektin classes: tektin-1, tektin-2, tektin-4 and tektin-3/5, respectively. All invertebrate deuterostome species we surveyed retain this ancestral state, as do ecdysozoan priapulids and several arthropod hexapod classes including Diptera, Coleoptera, Isoptera, and some members of Hemiptera. Importantly, due to the duplication of tektin-3/5 early in the spiralian and vertebrate lineages, no spiralians or vertebrates retain the ancestral bilaterian state. Therefore we suggest that studies to localize and determine the function of tektin genes would be especially informative in these species. Comparative studies of nonbilaterians with bilaterian species that have retained the ancestral tektin complement like the insects, D. melanogaster and T. castaneum among ecdysozoans, and especially the invertebrate deuterostomes could provide clues to ancestral tektin functions and offer insights into how their diversification contributed to evolutionary history and diversification of sperm and motile cilia function. A similar argument can be made to determine ancestral functions of tektins in spiralians and vertebrates. Our study supports the view that the last common ancestor of the spiralia and the last common ancestor of the vertebrates each had five tektin genes due to independent duplications of the tektin-3/5 gene. Among vertebrates this ancestral state is retained in all lineages except for the teleost fish and amphibians that appear to have undergone independent losses of the tektin-5 gene. Among spiralians the gnathiferan L. maerski, the gastrotrich L. squamata, the nemertean L. longissimus, the annelids P. dumerilii and C. teleta, the bivalve mollusks C. gigas and P. fucata, the flatworm M. lignano, and the brachiopod L. anatina retain this ancestral spiralian state and would be prime candidates for functional studies. We identified no members of the Xenacoelomorpha that retained four ‘bilaterian’ tektins. As a recent study has indicated that this phylum is the most basal bilaterian phyla and sister to the Nephrozoa , this could indicate that the duplication of the hypothetical ancestral tektin-4/3/5 that gave rise to tektin-4 and tektin-3/5 occurred after the split of the Nephrozoa from the Xenacoelomorpha. However, in our analysis the Xenacoelomorpha retained unambiguous orthologs of tektin-1 and tektin-2 and a third ortholog that clustered unambiguously with the tektin-4 s of other species. It is possible that this tektin-4 clustering is an artifact created by the generally longer branches and greater sequence divergence of tektin-3/5, while in actuality the Xenacoelomorpha’s tektin-4 represents a tektin-4/3/5. Given the current evidence, it may be equally likely that the duplication occurred prior to the split of Xenacoelomorpha and Nephrozoa and that the Xenacoelomorpha tektin-3/5 was later lost. However, if the former is correct Xenacoelomorpha may truly represent and have retained a ‘transitional’ ancestral bilaterian tektin complement of three. Our analysis identified several metazoan taxa with remarkable independent expansions of the ancestral tektin complement through duplications, including the ctenophore and bilaterian clade (two to four tektins), the insect lepidopterans (four to seven tektins), mollusk gastropods (five to six or eight tektins), as well as the leech H. robusta and the planarian S. mediterranea (five to ten tektins). These duplications may have played a role in the evolution and specialization of new cilia types or functions in these lineages. For example, ctenophores commonly named ‘comb jellies’ possess the longest known motile cilia that form their characteristic beating ‘combs’. As Tektin proteins have been shown to play a role in cilia stability and motility, extra tektin genes may have contributed to evolve these extraordinarily long cilia. In the case of gastropods and planarians, extra tektins may have played a role to facilitate their unique mode of locomotion that relies upon ciliated epithelia to glide along surfaces [18, 63, 64] and therefore independent expansion of tektin genes may have also played a role in making the evolution of this mode of locomotion possible. This argument is especially compelling for planarians as the closely related parasitic flatworms the cestodes and trematodes have lost some of the duplicated tektin genes, suggesting that this loss may reflect that tektins are no longer needed as these parasites no longer rely on a ciliated epithelium for locomotion. The expansion in lepidopterans is remarkable as they are members of the Ecdysozoa, a clade defined by its lack of motile cilia, and therefore the expansion to seven tektins must invoke perhaps novel functions. Studies in mouse and rat have indicated that tektins are not expressed in primary or sensory cilia in mammals [65–67]. However, the retention of a complete but divergent bilaterian tektin complement in ecdysozoans, and especially the expansion from four to seven tektin genes in lepidopterans might hint at a common yet ancient role of tektins for lengthy cilia in this clade perhaps in general and/or specialized sensory organs, respectively. Utilizing broader sampling of previously underrepresented taxa our study provides an updated framework that tracks tektin gene family evolution by gene gain and gene loss. 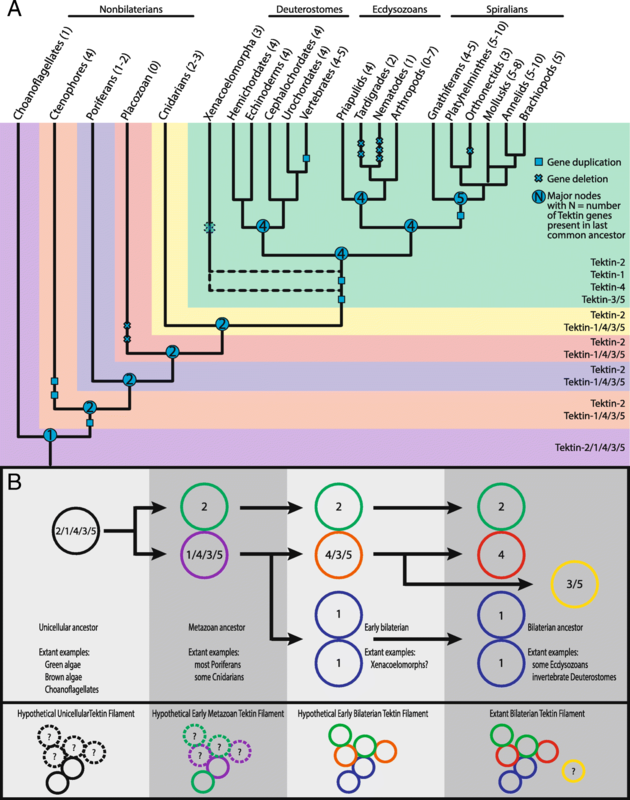 While the unicellular holozoan ancestor possessed a single copy tektin gene, the tektin gene complement expanded to two, three, and four tektin genes in the metazoan, bilaterian, and nephrozoan ancestor, respectively. Our analysis suggests that classification of bilaterian tektins into four classes, tektin-1, − 2, − 4, and − 3/5, would be consistent with their evolutionary history, and identifies tektin-2 as the earliest, and tektin-3/5 as the latest emerging tektin genes. 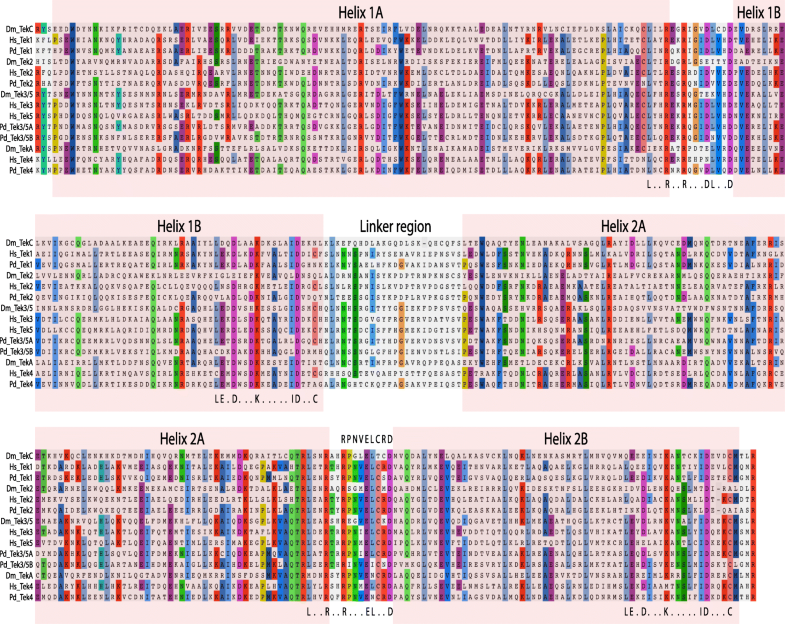 While tektin-1, tektin-2 and tektin-4 remained single copy genes in many bilaterians, additional gene duplications occurred more frequently in the tektin-3/5 lineage. Specifically, our study identified expansions, reductions, and sequence divergence of the tektin gene complement for over 100 extant species. Intriguingly, our study identified complete loss (in placozoans), extensive expansions (in planarians, in leech, and in lepidopterans), as well as ancestral conservation (in deuterostome invertebrates) of the tektin gene complement, suggesting several candidate species for future studies. More studies that investigate the entire tektin gene complement within informative species are needed to elucidate the various roles of the tektin gene family members for various ciliary functions within diverse metazoans. Investigations should determine the expression of tektin transcripts, localization of Tektin proteins, and functional studies in informative species to gain insights into ‘filamentous’ and/or other tektin functions. No comprehensive studies of tektin expression and/or function have yet been done in any protostome species. Especially spiralians, whose various larval stages utilize arrays of multi-ciliated cells called ‘ciliary bands,’ offer a fertile ground to explore the role of tektins to generate different types of cilia and ciliary functions, as well as to how tektin gene duplications and loss may have contributed to cilia and flagellar diversity. Species were selected to represent all major metazoan phyla as well as non-metazoan lineages. Attempts were made to obtain sequences from representatives of all metazoan phyla as well as taxa comprised of unicellular organisms known to have motile cilia and/or flagella. Tektin proteins were identified by reciprocal BLAST analysis using annotated H. sapiens Tektin protein sequences as queries against protein, transcriptomic and genomic sequence databases. More sensitive DELTA- and PSI-BLAST searches were used to confirm lack of Tektins in species and lineages for which BLASTP and T-BLASTN searches failed to identify any Tektin sequences. P. dumerilii Tektin sequences were obtained from transcriptomic data . A total of 439 Tektin protein sequences were obtained from 111 species representing 27 phyla including 24 metazoan phyla and Cryptophyta, Chlorophyta and Choanoflagellata among non-metazoans. For a comprehensive list of species used, the sources, as well as the sequence data see Additional files 2 and 5. Multiple alignments were performed with MAFFT  using the MAFFT iterative approach (MAFFT L-INS-i) . Alignments were visualized and divergent ends were trimmed using Aliview . Any positions with 70% or more gaps were removed (Additional file 4). Bayesian phylogenetic analysis was performed using Mr. Bayes ver 3.2.6 with the mixed amino acid substitution model with a proportion of invariant sites and gamma distribution (invgamma) . Analyses were run for 2,000,000 generations with a 25% burn in. Maximum Likelihood analyses were performed using RAxML ver 8 . Because RAxML does not offer a mixed amino acid substitution model, the Tektin alignment was submitted to the Prottest-3 server  for selection of the best model. LG substitution model with proportion of invariant sites and gamma distribution was selected (LG + I + G). Maximum Likelihood analyses were run for 1000 bootstraps and the best scoring tree was selected. Trees were visualized in FigTree (http://tree.bio.ed.ac.uk/software/figtree/). Tree figures were modified for publication in Adobe Illustrator. Very short sequences, sequences producing very large branches and unstable sequences not consistently clustering with any particular group in preliminary analyses were left out of final analyses. The authors wish to thank Lalith Khindurangala for helping with cloning and verification of sequences for P. dumerilii tektins. We would also like to thank Dr. Andreas Hejnol of Sars International Centre for Marine Molecular Biology for providing us with transcriptomic data for several species. Funding for this study was provided by the Roy J. Carver Charitable Trust and the National Science Foundation (Award ID 1455185) to SQS. All data analyzed in this study are available in the additional files. BRB and SQS designed the study. BRB obtained sequences, performed alignments, and phylogenetic analyses. BRB and SQS interpreted the data, wrote and approved the manuscript.